Drusus will point out the money pouches he found and then get his rope out of his pack to help Nok get out. whit10 wrote: Drusus will point out the money pouches he found and then get his rope out of his pack to help Nok get out. Are you volunteering to run the loot thread? Bru looks to the boy and offers him some dried jerky rations. "How far are the rest of the Reedfoots, young man? Could you lead us there?" Josef909 wrote: Bru looks to the boy and offers him some dried jerky rations. "How far are the rest of the Reedfoots, young man? Could you lead us there?" Huron greedily grabs the jerky from Bru. "I think I know the way back," he says, gnawing hungrily on the jerky. "But I'm scared. Will you come along? There may be more frog monsters about. Or those Iron Circle bullies." Leirthal detects a black magical aura emanate from the staff. The wizard recognizes the aura's color to be of the dread school of chaos. As he walks around the caves investigating, he detects a faint aura coming from below the pile of skulls. Staying on the plot line or in character garners inspiration points. I'm not doling out XP. Your characters all level at milestones. But I can hand out Inspiration points as rewards as I wish. Everyone gets 1 Inspiration Point. Bru, Cyc, and Ara each get 2. Great job everyone! Huron continues, "The Reedfoot clan has six keelboats scattered up and down the White River. Our leader is Willet Reedfoot. He's old, but tells some great stories. You may have seen him in one of the villages close to the watercourse? Anyways, he earns a living as a storyteller and is friends with Dar Gremath. "The White River runs the length of Hakenwold, varying 200 to 300 feet wide, and up to 10 feet deep. There are two ferries that cross the waterway-one near Tor's Hold, the other close to Easthill. Both are flatboats large enough for a horse and wagon, secured by thick hawsers. No one tends the ferries; travelers must haul themselves across." Under the pile of skulls, Leirthal finds an ordinary chest hidden there. The magic he detects is inside of it. Huron shakes his head emphatically. "I am happy to help, Mr. Cyc. My family's keelboat was anchored upriver, east of the ferry near Tor's Hold." He points out the ferry crossings on the party's map. "Nok! Quit fooling around and come here at once!" "Bran Torsson will like to know what we've done here, and maybe he can arrange a meeting with Dar Gremath as well if Willet is unable to. Something to think about as we make our way with Huron." If Nok finds nothing of value in the some pit, he will scamper up Drusus' rope as nimbly as a squirrel on clothesline. Nok has a smile in his heart. Leithy noticed he was gone. Um, if Nok fell into the 20' pit, he suffered falling damage. Result of the throw of dice "2d6" : 1 + 5 = 6 bludgeoning. The pit is empty except for some bones. Luckily no more oozes down there. Sounds like the rest of the party is ready to head out? Are you going to first take Huron back to one of his clan's keelboats on the White River? The halfling boy thinks they may east of the ferry near Tor's Hold (unless his people are presently out looking for him). Or will you go directly to Tor's Hold and perhaps try to talk to Bran? DM question: what time of day is it currently, and what's your estimation of travel time to, say, the western ferry Huron marked on our map? Robyo wrote: Um, if Nok fell into the 20' pit, he suffered falling damage. Result of the throw of dice "2d6" : 1 + 5 = 6 bludgeoning. Josef909 wrote: DM question: what time of day is it currently, and what's your estimation of travel time to, say, the western ferry Huron marked on our map? By the time you've finished the slaughter, and checked around, and spoken with Huron; let's call it noon. It's roughly 7 miles from the caverns to the western ferry, if you follow the river. Tears come into young Huron's eyes. "B-b-b-but y-you said you'd get me home by nightfall. My family may be out looking for me." He starts blubbering. "I want my mommy!" Drusus is obviously impatient... "Time to take the boy home, his tears are getting irritating"
"Nok, you should be more careful. You have not yet paid your debt to me. Now open this chest." navyik wrote: "Nok, you should be more careful. You have not yet paid your debt to me. Now open this chest." "Yes, Mr. Leithral. Sorry, Mr. Leithral. I know how much you fancy the shinies and I... the chest, right. On it, Mr. Leithral. Mr. Cyc, wait up for us! I want to talk to Huron too." what's the sequence in 5e? Perception to check for traps and then Thieves Tools to disarm\open lock? Perception to check for traps. The chest appears to be unlocked. Robyo wrote: Perception to check for traps. The chest appears to be unlocked. Nok doesn't notice anything trap-like on the exterior of the chest. Robyo wrote: Nok doesn't notice anything trap-like on the exterior of the chest. Nok is satisfied with his own work, but makes a great show of examining every side and latch while under Leithy's attention. Nok opens the lid with a flourish to Leithy, "Ta dah!" Nok opens the chest to reveal Gloorpk's hoard: a magic potion, a sapphire worth 100 gp, a suit of magic black iron chain mail armor, a magic maul inscribed with blue runes, and 170 gp. "Helluva job as always, Nok" Bru says as he offers out more jerky. "You gents want to follow the river, or make our way through the woods to avoid any more Iron Circle buggers?" Robyo wrote: Nok opens the chest to reveal Gloorpk's hoard: a magic potion, a sapphire worth 100 gp, a suit of magic black iron chain mail armor, a magic maul inscribed with blue runes, and 170 gp. Leirthal pockets the potion. "You brutes may carry the rest of these items for now, but do not use them until I have time to properly identify them. Powerful magic is not to be trifled with, mind you. NOT TO BE TRIFLED WITH. 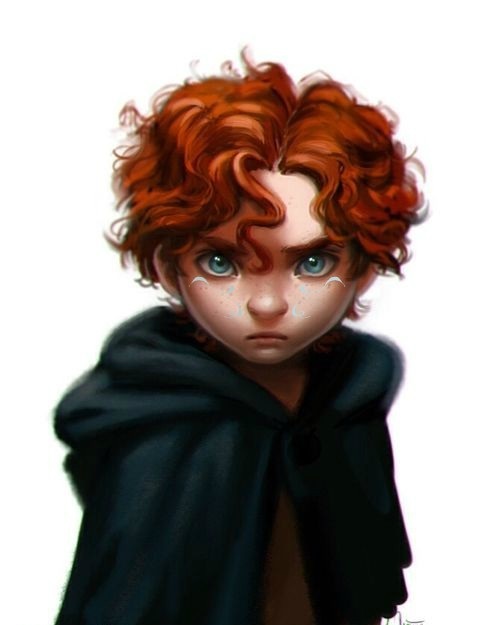 Let us off with the child to his family," Leirthal grumbles, passing the Dwarf and halflings as if to lead the way. "Bring some frog heads for evidence. Perhaps there's a bounty. Why are you dilly dallying?" I will update the loot thread later unless Josh really wants to do it. "Wait, did anyone search the pools?" Wouldn't detect magic reveal an ancient wizard trapped in a block of presumably magic ice? Robyo wrote: Huron...points out the ferry crossings on the party's map. The Druid Grove is not at all on the way to the ferry, halfling keelboats, or Tor's Hold. It's north of Albridge which is another 10 miles down river. Drusus' horse will have to wait awhile longer. GM's opionion: Easiest way to return Huron to his clan would be to follow the river. There are some trees along the way, but it's mostly a countryside of fields and farms in this area. A few groves are marked on the map (dark green). From the ferry, or anywhere further east along the river, when going to Tor's Hold, it makes since to NOT use the road, but that's totally up to you guys. From the frog caverns, you could bush-wack it thru forest most of the way directly to Tor's Hold. But then Huron would probably be upset. After Ara searches the cave and area for any and all salvageable arrows, he makes his way down to Cyc and the rest. So we're taking the young one home? I'll take lead as usual, and I say way stick to the woods to stay unseen again. I will signal of anything out of the ordinary"
Natural Explorer (Forest): You are particularly familiar with one type of natural Environment and are adept at traveling and surviving in such regions. When you make an Intelligence or Wisdom check related to your favored terrain, your proficiency bonus is doubled if you are using a skill that you're proficient in. •	Difficult terrain doesn't slow your group's travel. •	Your group can't become lost except by magical means. •	Even when you are engaged in another Activity While Traveling (such as foraging, navigating, or tracking), you remain alert to danger. •	If you are traveling alone, you can move stealthily at a normal pace. •	When you forage, you find twice as much food as you normally would. •	While tracking other creatures, you also learn their exact number, their sizes, and how long ago they passed through the area. Ara will use his tracking to try and find traces of Huron's tribe along the way.